Only 500 remain! The Ethiopian wolf is the rarest dog species in the world. Ethiopian wolves, with their distintive red-tinged coat and bushy tail, are only found in the highlands of Ethiopia and are Africa’s most threatened carnivore. The biggest, most immediate threat to Ethiopian wolves are lethal diseases carried by domestic dogs such as rabies and canine distemper. Other threats such as habitat loss, due to high-altitude agriculture and overgrazing by domestic livestock, road kills and persecution are also a concern. 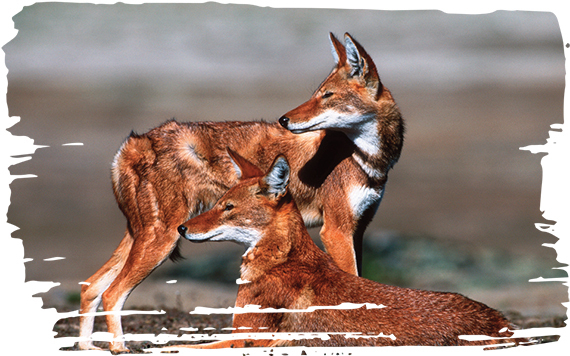 Funds from your adoption will help support The Ethiopian Wolf Conservation Programme (EWCP). Through EWCP, we support conservation, monitoring and management of Ethiopian wolves, along with disease prevention and control through vaccination programmes. 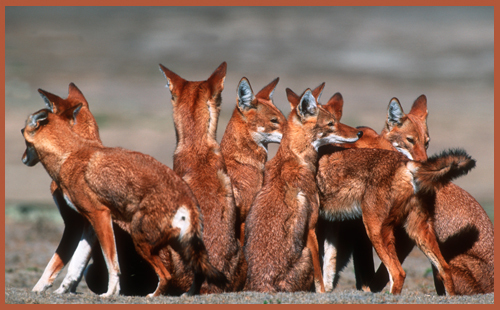 You can help ensure their future by adopting our Ethiopian wolf family below. This family of wolves lives in Ethiopia’s Bale Mountains. Less than 500 Ethiopian wolves survive. Led by an alpha male and female, all pack members help care for their pups. Help us provide the protection they need.